Brachial plexus consists of branches of the lower four cervical nerves (C5-C8) and the first thoracic nerve. These networks of nerve fibers are located deep within the shoulders behind the collar bone and between the neck and the armpits. 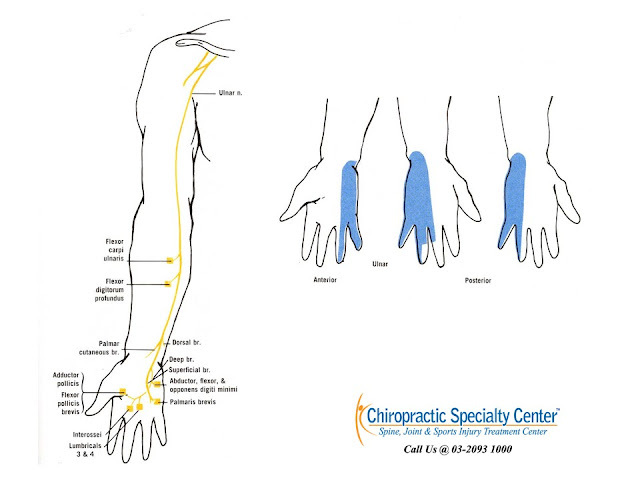 Musculocutaneous, ulnar, median, radial and axillary nerves are the major branches of the plexus. These nerves supply the muscles and skin of the arm, forearm and hand. The ulnar nerve pierces the intermuscular septum in the arm and travels deep to the medial head of the triceps muscle. It is located in a groove behind the elbow, more commonly known as the funny bone. It then enters the inner side of the forearm and travels down to the hand. There are a few situations where the ulnar nerve can be injured. The dynamic valgus force of throwing can result in traction injuries to the nerve. This condition can be aggravated if there is instability of the inner elbow. Chronic compression at the cubital tunnel as the nerve passes between the two heads of the flexor carpi ulnaris muscle. The nerve is irritated due to inflammation and adhesions from repetitive stresses and muscle overdevelopment. Ulnar neuritis, inflammation of the nerve, can occur as a result of direct trauma or recurrent subluxation due to acquired laxity from repetitive stress. Irregularities or deformities within the ulnar groove, for example, bone spurs, are common in overuse injuries in throwers. If you have had an Unlar nerve injury, you will need specialised treatments through our clinical physiotherapy in Malaysia. We have the skills, knowledge and technology to treat you better.